Time to get your craft groove on. 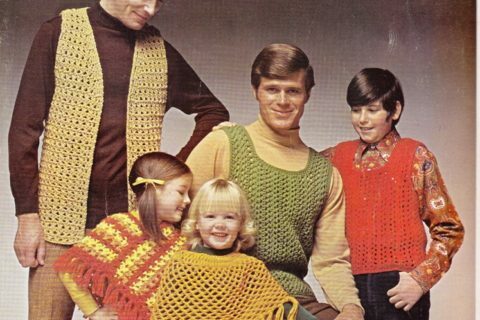 For the crochet crowd, take a look at the granny square “fashions”. I know the men will want to get a granny square tie. 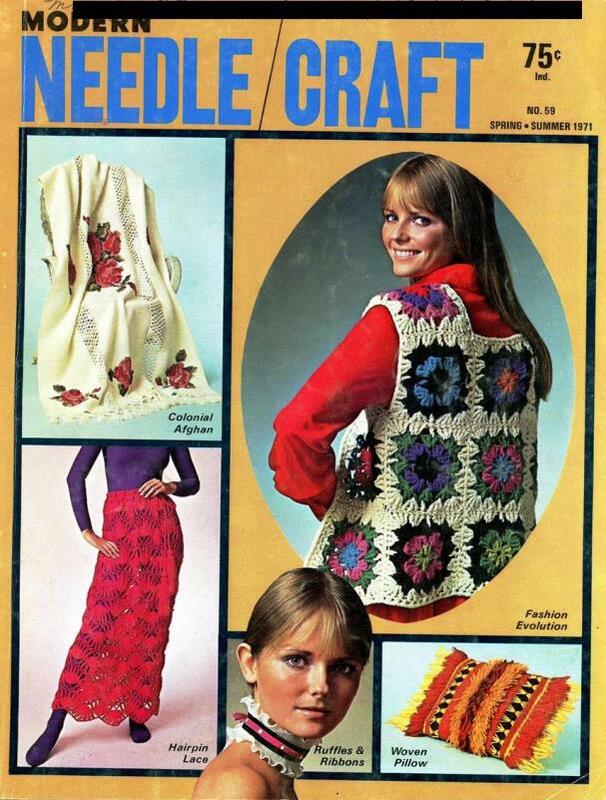 I am not sure that granny squares = groovy mod fashion. 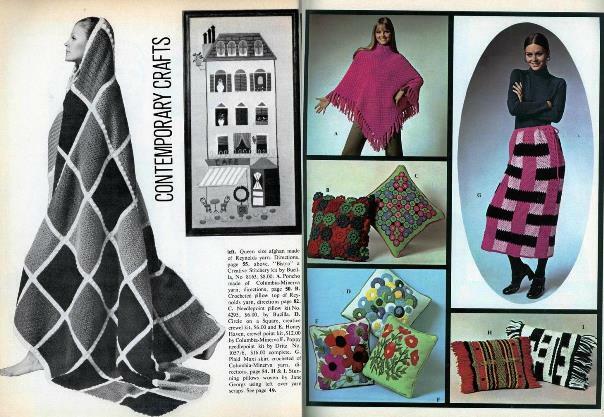 Just about every couch in America probably had some kind of afghan within reaching distance in the 1970s and into the 1980s. 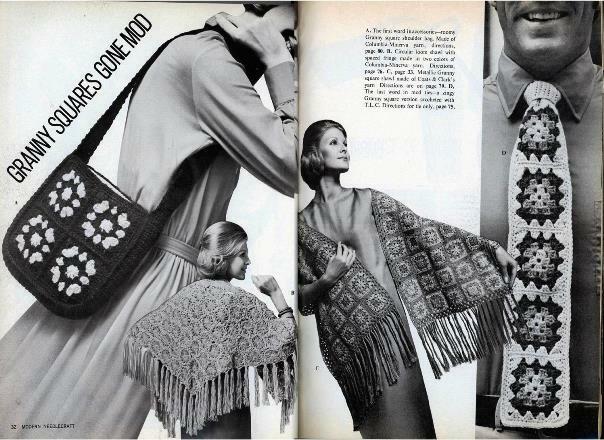 The ponchos and vests might work depending on colors, but I am not sure a poncho works as a skirt. The skirt on the front page would have looked really good as a scarf. The guy wearing the granny squares tie wonders why he never gets promoted. OK that tie wins the ugliest tie competition. 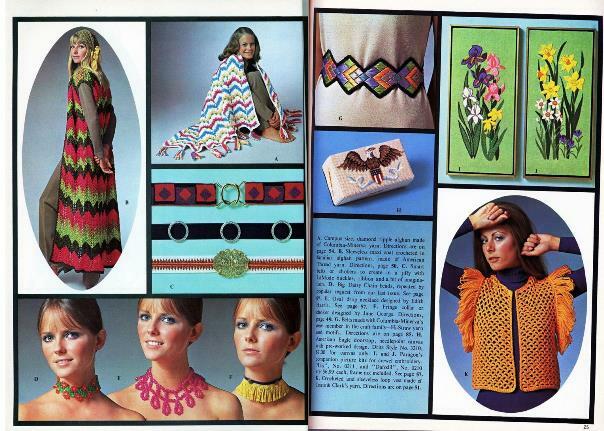 This book is a time capsule of an interesting interlude in fashion history. 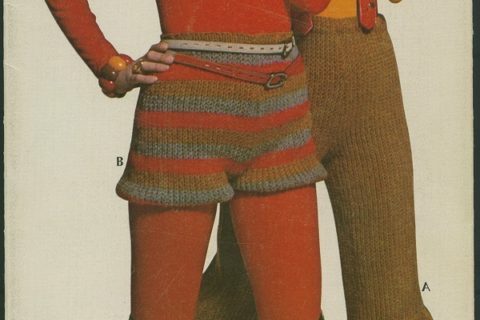 In the early 1970s hippie styles were becoming mainstream in the U.S.A. The idea was to be ‘kicky’ and colorful. It was also a good thing to be ‘original’. At the same time, older Americans were becoming enthused about the Bicentennial in 1976. This included a renewed appreciation of traditional American crafts. Yes, the dreaded apple-head dolls fit right in with this view. The long vest in the illustrations offers a bit of both. The shape and colors are young and vibrant. However, the pattern is very reminiscent of Bargello work and Bargello was popular for upholstery in the Colonial and early Federal periods. This book could be a useful addition to a collection on fashion history. 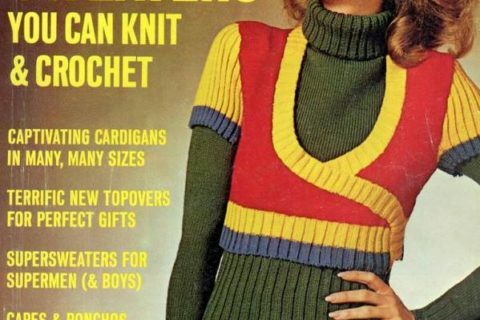 If you saved your 70’s poncho or super-long vest, you are in luck! Back in style! 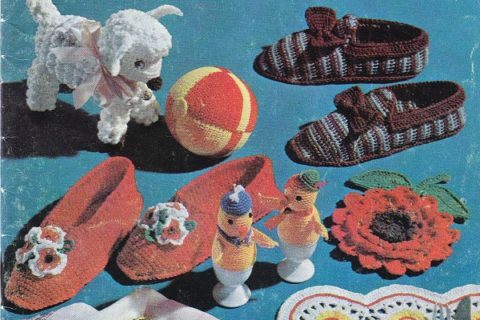 We had those same needlework green background flower pictures hanging in the hallway when I was a kid. Yes! 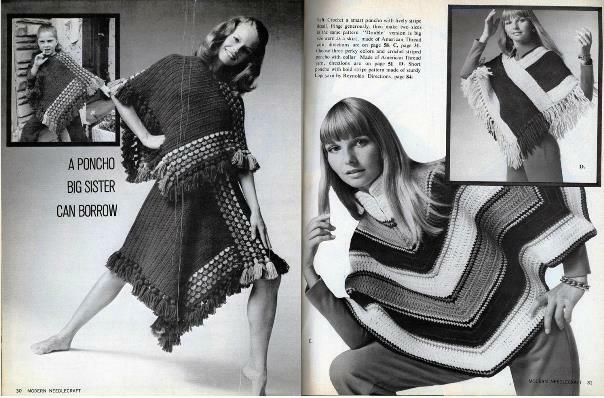 And Shelley Hack under the ample Afghan above the Tiegs trifecta of throatwear. Knowing the value of breathable fabrics, Cheryl continued to display generously-spaced weaves in her choice of swimsuits. There are a lot of perfectly good designs in here, but they’re mixed in with a few that are just terrible! A crocheted necktie, seriously?